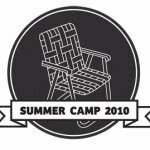 Closing day of Summer Camp 2010! Bring the family to make buttons with The Fabric Lab! Professional actors will perform in-store at the top of every half hour starting at 5 p.m. Finally, the YesPleaseMore POP-Up Store hosts PechaKucha #11 featuring designers from the store! RSVP on Facebook by clicking here. The Fabric Lab Button Making: 2-4 p.m.
YesPleaseMore is located on the 2nd floor of The Denver Pavillions next to Barnes and Noble Bookstore.